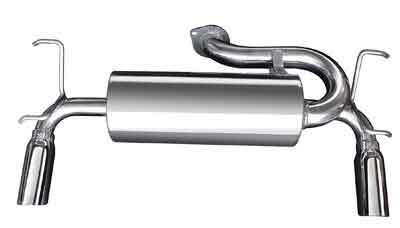 Our Best Selling MX5 Miata Muffler! Our Best Miata Exhaust! We are so confident this is the best MX5 Miata exhaust that we let you drive it for 90 days and if at the end of 90 days you don't love it, you can send it back in original package for exchange to any of our other choices! Promised for years and we finally got it done, a revised version of the famous RoadsterSport Q that is even more successful at controlling sound for customers making modifications such as highflow headers and superchargers. This is also our top recommendation for customers with automatic transmissions, and or customers with the PRHT hardtop, or any customer wanting something deep and throaty when they put their foot in it but not shouting at them when they are just in cruise mode. This attenuation design is a premium "NO-DRONE" choice, great for those with manual transmission and especially for those with the AUTOMATIC transmission (which tends to keep the RPMS in the lower ranges). By using smooth mandrel bent 2.5 inch tubing to redirect the flow for a side entrance to the muffler we engineered a sound wave attenuation first chamber to knock down volume level dramatically while maintaining a flow-through design. This attenuation chamber design muffler is the most mild and mellow on an otherwise stock MX5 Miata...about 10 to 15% louder than stock...with a deep sporty burble anytime you hit the go pedal but quiet when you are just cruising. This premium MX5 muffler is also the BEST choice for those who plan such additional mods as a supercharger or header change (a header change unleashes a massive amount of additional sound). Our latest and best dyno results for an otherwise stock Miata....and for modified Miatas with the header change all the way to supercharged were obtained with the RoadsterSport Q muffler. ALL THE FLOW, without the noise! Yes, simple BOLT ON that bolts to our midpipe, or the factory midpipe, or our Racing Beat midpipes. INCLUDES New Gasket and fresh Nuts and Bolts to make your install super easy. Weight is 24.5 pounds with baffles removed, 26.5 pounds with baffles installed (stock muffler is over 27 pounds). Finished in tips which INCLUDE our exclusive baffle cone inserts which are REMOVEABLE and allow you to set the sound to sporty...or quiet. Also available are optional packed baffles (see separate product description) with which you can quiet it down even more for those using a header or supercharger, or race midpipe, etc. This system is 10% to 15% louder than the stock Miata muffler on an otherwise stock MX5 Miata exhaust system....and only 25% over stock sound level when used with our complete 2.5 inch RoadsterSport header and 2.5 inch RoadsterSport midpipe. Baffles are retained by small hex bolts inserted from well under each tip. Proudly made in the USA with a LIFETIME WARRANTY, emissions legal in all 50 states! Fits all 2006 and newer Miatas with manual or automatic transmission, soft top or retractable hardtop. Installation of this Miata exhaust is SUPER EASY...just two bolts! You don't even need to jack up the car, this installation can be done in your driveway! Installation notes on our forums --- CLICK HERE TO READ MORE. This Miata exhaust is guaranteed for as long as you own your Miata. BRIAN'S APPLICATION NOTES: Everything we have learned about MX5 Miata exhausts, all our best tricks, have gone into this RoadsterSport Super Q. It is the perfect FIRST MODIFICATION and still the best choice for anyone planning future upgrades such as a header change or supercharger. It is quiet when you cruise down the freeway but delivers a sporty deep burble when you push your foot harder on the gas. This Miata Exhaust is the choice on my own soft top MX5 for driving around town...and my wife's PRHT MX5, and my strong recommendation for anybody wanting an exhaust with a super smooth burble, or any owner planning additional exhaust changes (header change or supercharger). This is also our top recommendation for owners of the automatic transmission and Power Retracting Hardtop. Does NOT fit with most hitch setups, both items trying to live in the same space and the hitch can damage the muffler. MAY 2012 Update: New Rolled Tip Design! Had many requests for a new thicker rolled tip. The problem with the rolled tips that all our competitors use is that they are very heavy, which helps partially explain the ugly fact our competitors don't want to admit...which is that most our competition is HEAVIER than the stock muffler. As a famous racer once said, weight is the enemy, and making a muffler that is heavier than stock and calling it a 'performance muffler' is not our style here. It took a big investment in new equipment to come up with a rolled tip that didn't add weight to our best performance design...but it was worth it. These new dual 3.5" OD outlet tips complete the look of the exhaust and provide a more aggressive and sporting appearance. Yes, still works with, and includes, our unique removeable baffles that put YOU in control over final sound levels. SOUND Files at our Exhaust Blog---CLICK HERE TO LISTEN AND READ MORE. White 2013 below shows how standard length version fits another version of factory lower rear valance (if you want the tips longer that what you see here, then look at our version for Appearance Package). Video below of baffle removal process. Read full installation hints and notes in our forum Installation Instruction Section! The secret is LUBE your hangers well with dishsoap so you can get flanges aligned properly, and torque the supplied hardware to NO MORE THAN 25-30 ft/lbs (using more torque will actually result in LESS seal because you will pucker the flange out at the middle). INTERNATIONAL SHIPPING NOTES: We only ship to USA and Canada but we do have dealers outside the USA. CUSTOMERS IN EUROPE CAN GET THESE IN EUROPE AT THIS LINK! CUSTOMERS IN Australia CAN NOW GET THESE AT THIS LINK! A car, is a car, is a car and is for transportation, but that was the past. I've never put any type of mods on a car before. That is before giving up my motorcycle after 50 years of riding. I went into 3 weeks of depression before I bought the "wee car", a PRHT as a replacement for my adrenalin fix. She already put a smile on my face, but needed to have a little louder voice. I read all your reviews about the Super Q because I didn't want drone. The first thing we did was pop out the baffles; let's go for maximum noise. Top up, you can hear her talk, but it's not obnoxious. Top down, she has a nice little growl. I'll pull up beside any vehicle with a big power plant of an engine, and just grin at them...and goose it! It's got a great sound and puts an even bigger smile on my face. Not sure what hasn't already been said about this thing's ability to properly conduct the symphony that is the MX-5 exhaust note, but it does it perfectly. Without installing the baffles (yet...) it is keeping the sound from a full PPE header / midpipe combo down to civilized levels and the overall tone is fantastic. The biggest requirement I had was that the exhaust be a no-drone system. Without the baffles, there's a 300-500 rpm drone on deceleration (under 1800rpm down to about 1400rpm). Still, on the highway....and when the RPM's are past 2k.....no drone. The exhaust lacks volume. Per the product name...it is Super Quiet. While this particular exhaust is very quiet, it does have a lot of personality. That is, from the cabin, you can hear the system pop and burble....if you look for it. I'm sure is more audible from the back end of the vehicle. The product description mentions that the Super Q is about 10-15% louder than stock. That sounds about right. The quality of the exhaust note is very nice. One thing of note for me was that the car's cabin noise with the power retractable top up seemed to be noticeably quieter. The interior seems less buzzy....it seems like the exhaust balances the engine noise and exhaust noise so the cabin is more pleasant to be in. With the news of a CARB legal Supercharger coming soon, I hope the Super Q gets better volume without any additional drone. For PRHT owners who take their cars on long drives....the Super Q should be on the top of your list. I was a little apprehensive when I purchased this exhaust. I live in an apartment that has some rules against loud cars. However, after installing, I was quite pleased with how subtle (yet noticeable) the volume change was, even with the silencers removed, and the pleasant change in pitch from the factory unit. If anyone is concerned with noise levels, this is definitely the exhaust to get. So far, I'm really liking the Super-Q. This is a very nicely constructed chunk of metal and also a work of art. If you're worrying about it being too loud like I was, do not be concerned. I pulled the baffles out after the first test run around the block, and it still wasn't close to being offensive or attracting negative attention. Compared to stock, it is very noticeably deeper just above idle, moderately ballsier under full throttle, and the rest of the time there's just enough additional volume to notice that it's there. I found no unpleasant sound characteristics, even with the top up (PRHT). Installation was very straightforward, and the fit was excellent. The only frustration, as others have mentioned, is getting the rubber hangers to cooperate. The soapy lube is a must, but it was still a bit of a struggle by myself. Using a long screwdriver for leverage finally did it for me, and it would probably be a breeze with a proper tool made for the job. I didn't really notice much of a performance difference, but I only got a couple of drives in before the snow and salt hit the roads, so any more testing will have to wait until Spring. Lastly, it looks fantastic - much beefier than the stock tips, and the alignment with the bumper cut-outs is spot-on. Overall, I'm very happy with this upgrade. Got the "Super Q". Put it on myself, took 90 minutes. Most of time was figuring out how to manhandle the 4 rubber bushings. Once I got the screw driver involved they popped off easily. (don't know if that's recommended, but I was prepared to cut them off at that point). Definitely a good beginners project as I have only experience changing oil. The difference is subtle at first, but it is noticeable. I wanted it louder, but I do plan to do the mid pipe and headers, which I've read will bump the db's up to where I want them. The product itself looks beautiful, and it almost seems a shame that only the tips get seen. Very happy with the product. Easy install. Good looking tips. Sound is mellow, I prefer it to be a bit louder. Not any different than stock while cruising. Sounds great under acceleration. I run with baffles out always. I have a PRHT and it's just fine. I purchased a 2011 Miata on 9/3/15 and it had straight pipes after the mid pipe with NO muffler. Quickly installed the Q muffler. I donÃ¢â¬â¢t have any comparable muffler info but I really like the Q sound. Removable baffles are a plus so you can have it quieter or louder. I like the baffles removed. Quality stainless build. A really nice piece for the money. Would buy it again. Pro - Adds a nice mello sound to a rather quiet stock exhaust. Cons-Wish it was a little louder.